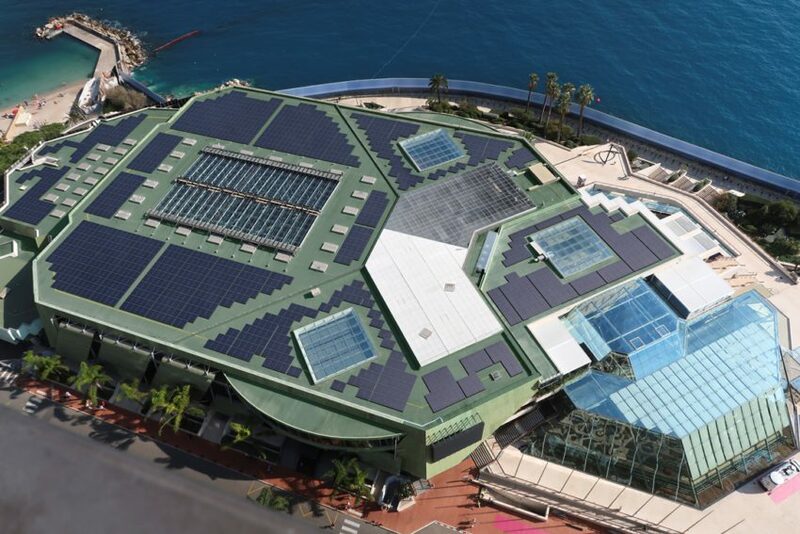 It’s been a few years now that Grimaldi Forum Monaco and the Monegasque Company of Electricity and Gas (SMEG) have partnered on a concrete commitment of actions in favour of energy transition. This partnership will continue with the installation in 2019 of a photovoltaic power station on the roof of the building. This project is testament to the true political will from the Princely Government, which gives financial incentives to those organisations with a corporate social responsibility, especially regarding the production – and the saving – of energy. The solar power station of Grimaldi Forum will be the largest in size and power of the Principality (2470 sqm, 490 kw, 600 MWh of annual production are the equivalent of the electricity consumed by a hundred houses), making the convention centre the first green energy producer in the Principality. This operation is an anticipation of the integration of the Grimaldi Forum into an eco-district that is planned to emerge from reclaimed land on the sea, an urban project that will make a new territory of 6 hectares. The project, due to be completed in 2025, will include housing, public parking and a wide range of facilities, a lively harbour with pedestrian quays, a green park, a coastal promenade, a shaded passage along the Japanese Garden as well as an extension to the Grimaldi Forum. A major player in the meetings industry, the Grimaldi Forum Monaco will benefit from this ambitious urban achievement, allowing it to increase its exhibition capacity by 50%, with an additional surface of nearly 6,000 sqm. This new area will accommodate large shows, allow more events to be held simultaneously, and make its offering more flexible, with the possibility of original event formats.